What separates the very good clinicians from the truly outstanding ones? More often than you might imagine, the difference lies not in technical mastery or specific knowledge of disease processes, but in understanding relevant anatomy. A sound anatomic background helps you improve your ability to recognize potential pitfalls and to effectively handle problems when complications do arise. While there are many atlases and technical references available in the rapidly growing field of spine surgery, most focus exclusively on operative technique alone and make only a passing reference to the anatomic considerations that greatly influence both short- and long-term outcomes. An Anatomic Approach to Minimally Invasive Spine Surgery fills this gap by offering an anatomically oriented presentation of the latest developments in minimally invasive surgery for the cervical, thoracic, and lumbar spine. Each chapter in this comprehensive reference balances clinical anatomy with specific surgical applications. Every procedure is described in precise step-by-step fashion and is accompanied by detailed color illustrations and intraoperative images that highlight the key steps for performing these techniques safely and effectively. Numerous preoperative and postoperative images demonstrate the possible results that can be achieved. Instrumentation, monitoring, outcome analysis, and complications are also discussed in detail. An Anatomic Approach to Minimally Invasive Spine Surgery is edited by preeminent experts, Dr. Mick J. Perez-Cruet, Dr. Larry T. Khoo, and Dr. Richard G. Fessler, who are joined by a group of outstanding contributors. This comprehensive publication is filled with detailed anatomic and clinical information, collected throughout the years of these experts' experience, to help the spine surgeon skillfully execute minimally invasive procedures for each region of the spine. 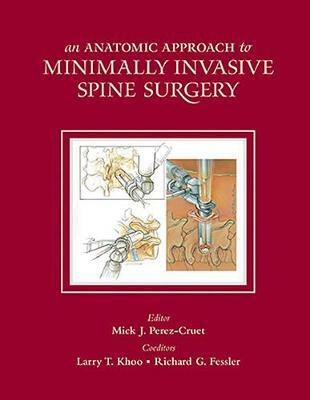 Comprehensive chapters are included on the range of minimally invasive spine surgery operations. Of particular importance is the chapter on complication avoidance; this invaluable chapter provides the reader with information on potential complications and how to avoid them to help ensure safe procedures, improved patient outcomes, and reduced healthcare costs. In addition, chapters on minimally invasive fusion and instrumentation, percutaneous pedicle screw targeting, injection-based spine procedures, and artificial disc technology present cutting-edge developments in the field.